Adrian Valderrama, a freshman at UNT who spent last summer with Spirit's tenor line (her second year), sent in this one. 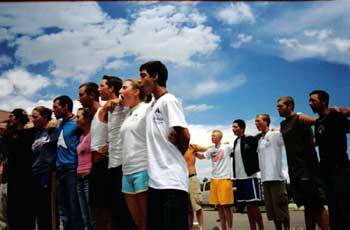 "This picture was taken on the day of finals in Denver as the horn line sang "Band of Brothers" for the last time. It was an emotional day and I think this picture shows a little taste of that. Awesome summer, guys."